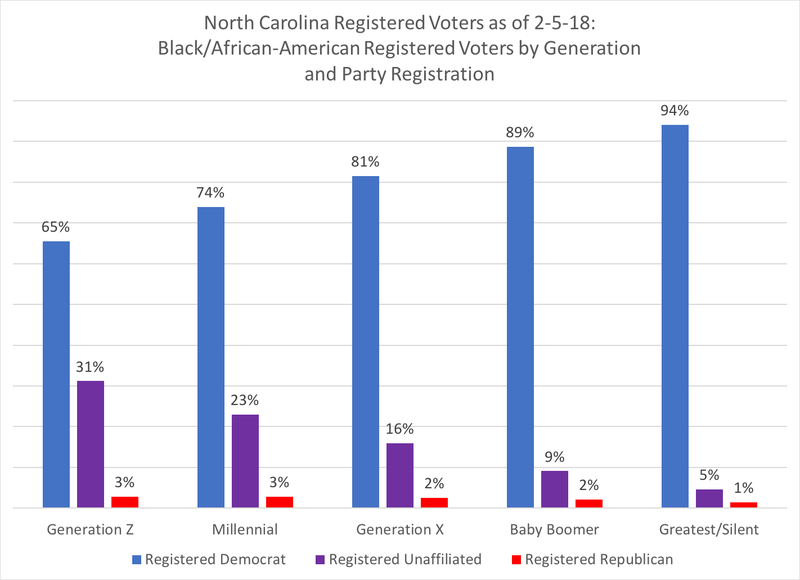 In my 2017 year-end analysis, I thought that voters under the age of 37--Millennials and Generation Z voters--would eventually become the largest voter bloc in North Carolina's voter registration pool, but I wasn't sure when that would happen. 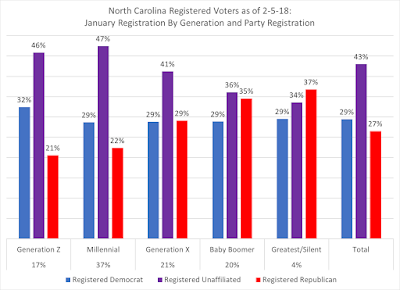 Well, as of Monday, February 5, 2018, it happened. 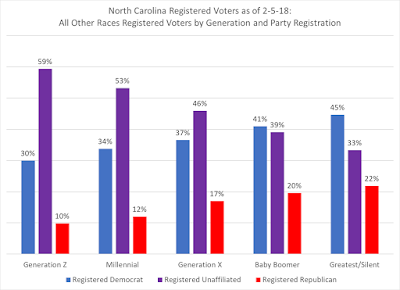 In today's release of data by the NC State Board of Elections, voters who were born since 1981 are now 32 percent of the 6.8 million registered voters in the Old North State, while another 31 percent of voters being Baby Boomers in the pool. 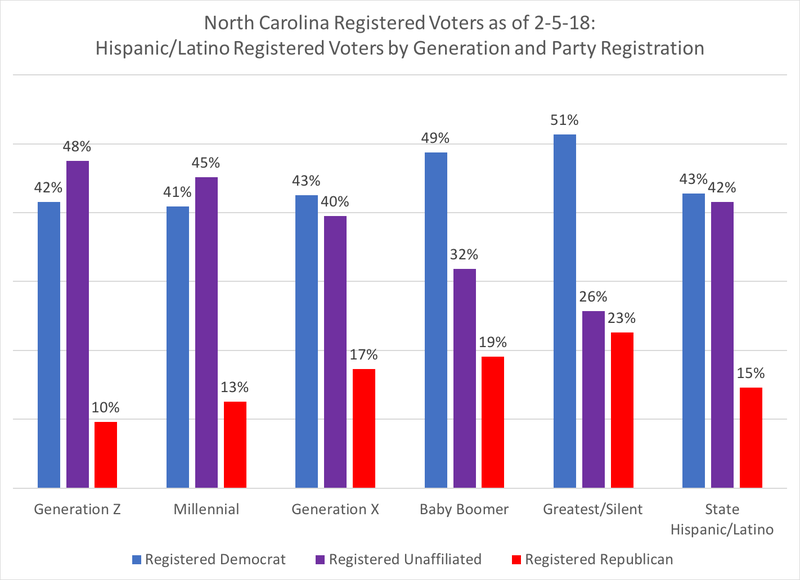 Generation X, sandwiched between Boomers and Millennials/Z cohorts, are 27 percent, with the Greatest/Silent generation (74 years old and older) 10 percent of the pool. 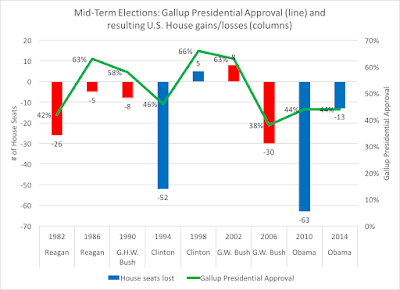 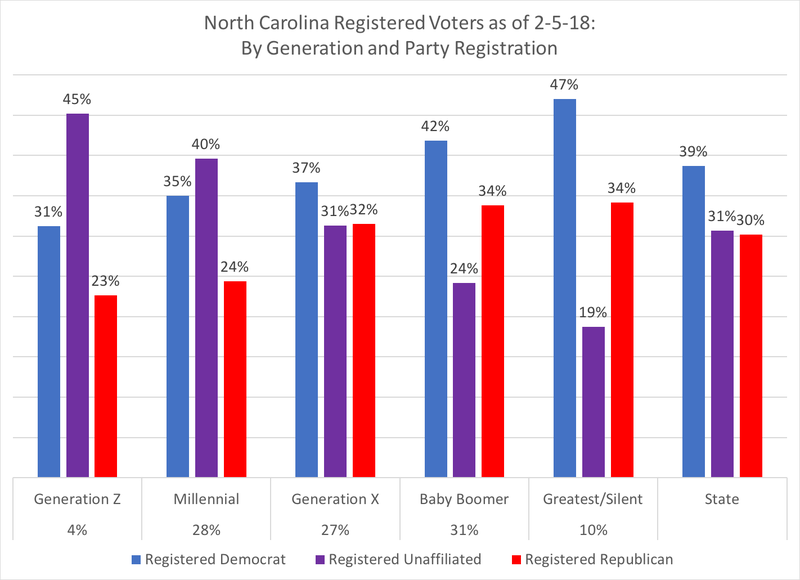 Moving from the oldest voters (Greatest/Silent) to the youngest voters (Generation Z), there's a drop in both the partisan affiliation and corresponding rise in unaffiliated registration. Among Gen Z, 45 percent of the newest cohort entering into the state's voter pool are unaffiliated in their registration. 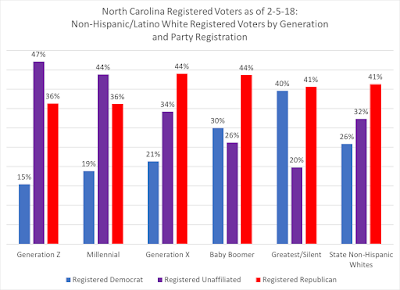 While non-Hispanic white voters in the South are traditional Republicans, voters under 35 (Millennials and Gen Z) are markedly different from their older cohorts. 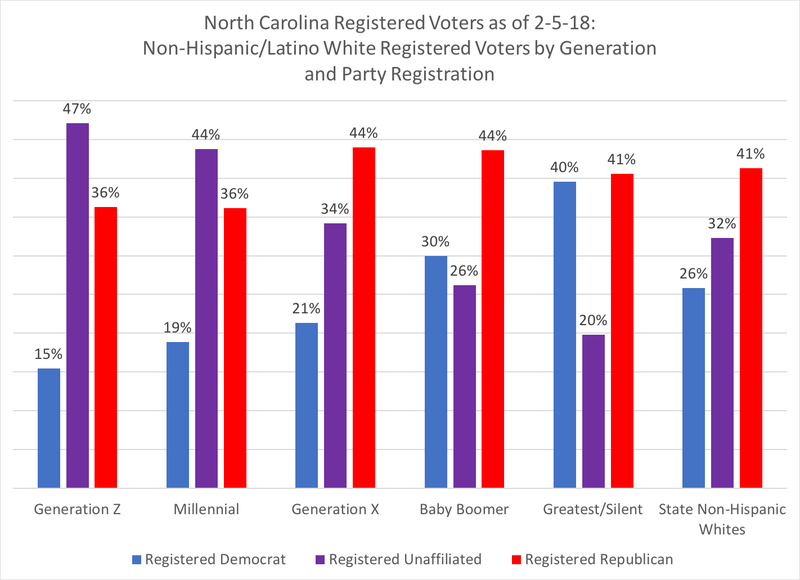 Democratic registration is falling considerably among this group, with only 15 percent of Gen Z non-Hispanic whites affiliating with the Democratic Party. 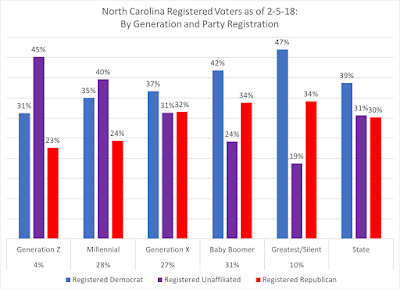 Nearly half--47 percent--of this youngest cohort are registering unaffiliated. 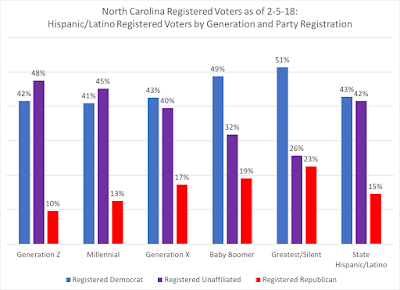 Among the youngest voters, Republican registration is only 13 percent for Millennial Hispanic/Latino voters and 10 percent for the same group. 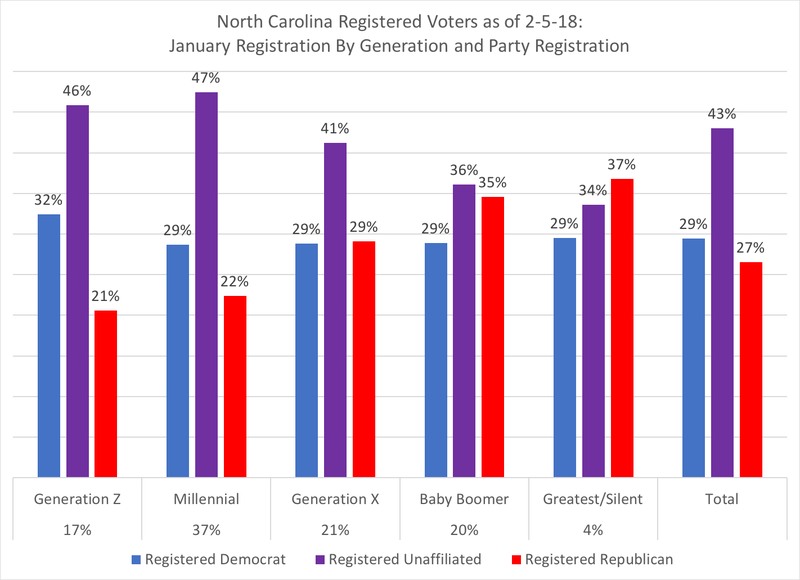 Finally, to start the year, I looked at January's registrations, broken down by generation and party registration: 43 percent of new voters registered as unaffiliated. 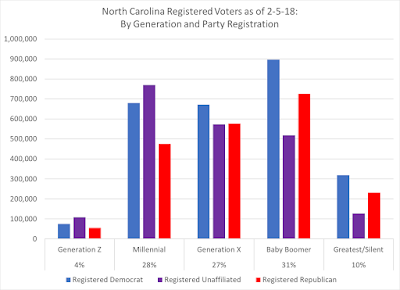 Well over half (55 percent) of the first month's registrations were from Millennials and Gen Zers, with significant pluralities of both generation cohorts registering unaffiliated. 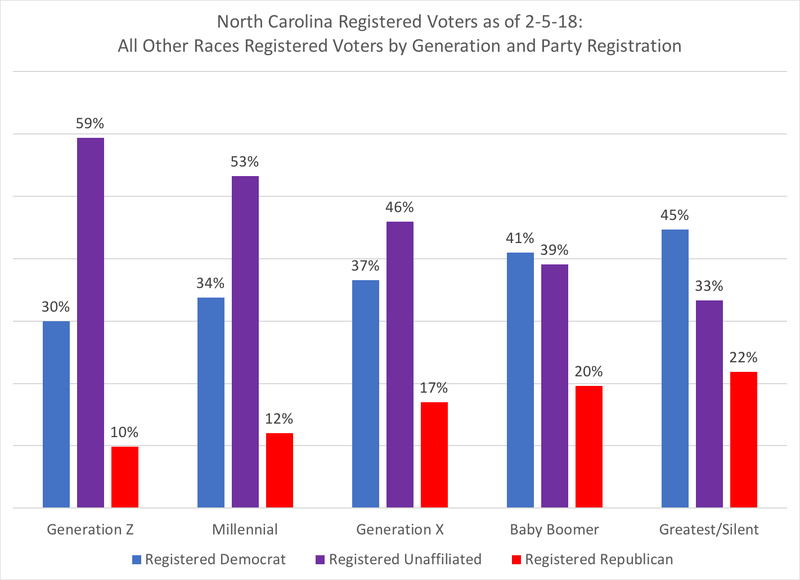 With the plurality of North Carolina's registered voters now heralding from Millennials and Generation Z cohorts (and growing), a major shift in North Carolina politics continues--of course, the next big question is: will these younger voters show up in November? 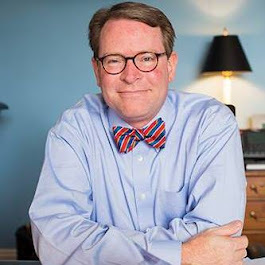 Only ten more months until we find out the answer to that question.